This workshop is open to dance teachers of all styles. The Pedagogy Classes will be from June 26th to June 30th from 9.00 to 12.00. The Technique Master Classes will be the same days from 13 to 14.30 and taught by Marnie Thomas and Carolina MÃ¡rquez. Dance Conservatory of Malaga, Spain. After graduation from Sarah Lawrence College in 1958, Marnie Thomas joined the Martha Graham Dance Company, touring and performing with the Company, teaching at the Graham School, and was privileged to be part of the first generation of women to perform Ms. Grahamâ€™s own roles as Graham began choosing successors for her earlier repertory reconstructions. 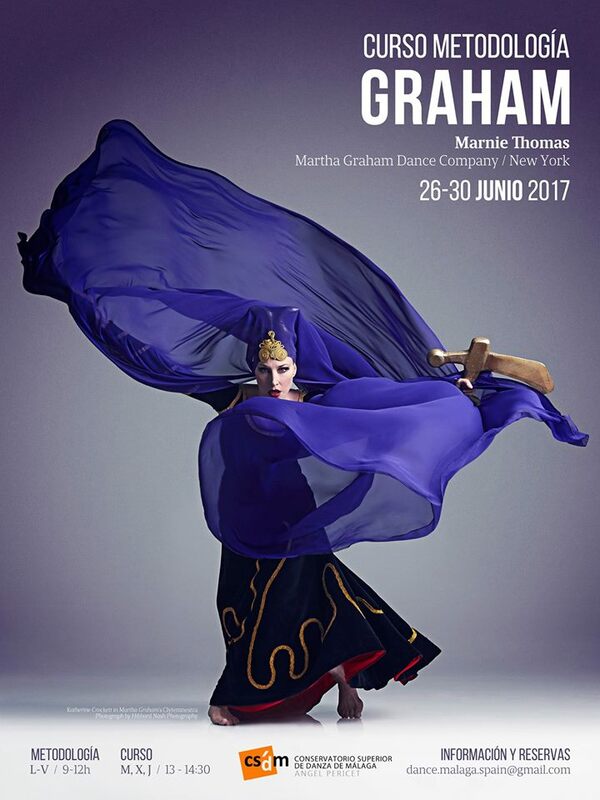 Ms. Thomas returned to New York to serve as Director of the Martha Graham School of Contemporary Dance from 2003 through 2006. Currently, Ms. Thomas serves as a consultant and rehearsal coach for the Graham Company and is a faculty member of the Martha Graham School, Peridance International, and Adelphi University. Carolina MÃ¡rquez holds a Professional Diploma in Dance Studies from Trinity Laban Conservatory in London and a floor barre certification by Zena Rommett. She has a degree in Professional Dance Studies and Pedagogy from the Martha Graham School of Contemporary Dance in New York. She has danced and choreographed for El Curro DT (Madrid), Trinity College of Music (London), From the Ground Festival (NY), Trolley Dance Festival (San Diego), Alto Jonio Dance Festival (Italy), RDC Youth Company (Birmingham), among others. She has taught at several prestigious american schools and universities like New York American Ballet Theatre, Webster University, Center of Creative Arts (COCA), Washington University, and San Diego Ballet. In Madrid, she has been a teacher at Madrid Dance Center, Scaena Carmen Roche, Karen Taft, BambÃºdanza and Kirtan VÃ­ctor Ullate. She co directed the caraBdanza company and caraB Performing Arts School from 2014 to 2016 in Madrid.